Kings XI Punjab are set to host the Rajasthan Royals in Mohali for another enthralling IPL contest on Tuesday. The hosts will be desperate to get back to winning ways, having lost back-to-back matches, while the Royals will be confident after thrashing the Mumbai Indians in their last outing. Both teams will square off for the second time this season, with the Kings XI Punjab emerging victorious by 14 runs in the previous encounter. KXIP started their campaign in flying fashion but they seem to have lost their way in the middle of the tournament. With four wins and as many defeats in their eight outings, the hosts are currently fifth in the points table. KL Rahul and Chris Gayle have been in great form for KXIP, with the ace duo providing their team with flying starts on several occasions. However, their bowling unit has been under the scanner, following their disappointing performances in the last couple of games. Apart from Ravichandran Ashwin and Sam Curran, there are no genuine wicket-takers in their bowling line-up. Meanwhile, Rajasthan Royals are looking to bring their campaign back on track after a flurry of disappointing performances. 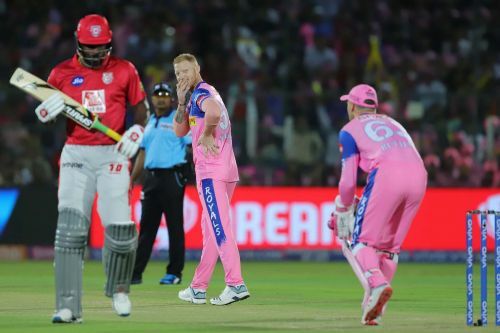 Jos Butler, Steve Smith and Ben Stokes have been scoring runs consistently for the Royals, while Jofra Archer and Shreyas Gopal have led the bowling attack. The visitors would be eyeing to breach the Punjab fortress in the upcoming match at Mohali. Currently, they are languishing at the second-last spot in the points table with just two victories from their seven matches. Ajinkya Rahane will have to take up the responsibility and lead his side from the front if they want to qualify to the playoffs. Ashwin and company are likely to go ahead with the same playing XI. Krishnappa Gowtham might be replaced by Riyan Parag in the starting lineup. Rajasthan Royals: Ajinkya Rahane (C), Steven Smith, Dhawal Kulkarni, Aryaman Birla, Rahul Tripathi, Stuart Binny, Mahipal Lomror, Sanju Samson, Shashank Singh, Riyan Parag,Shreyas Gopal, Krishnappa Gowtham, Jofra Archer, Ben Stokes (WK), Jos Buttler, Jaydev Unadkat, S Midhun, Prashant Chopra, Liam Livingstone, Manan Vohra, Shubham Ranjane, Ashton Turner, Varun Aaron, Oshane Thomas, Ish Sodhi. Ajinkya Rahane (C), Jos Buttler (WK), Steven Smith, Liam Livingstone, Sanju Samson, Rahul Tripathi, Krishnappa Gowtam/ Riyan Parag, Jofra Archer, Jaydev Unadkat, Shreyas Gopal, Dhawal Kulkarni.